About Us – Rainbow Foods (Pvt) Ltd – Exporting Tuna & Other Sea Food Products World Wide. Rainbow foods (Pvt) Ltd exports Fresh and Frozen Tuna with other verities of Seafood. The incorporation of Rainbow Group of Companies has broad in depth Seafood experience is gained through the decades by its proprietor and managements in related trades and develops a diverse line of top quality products for human consumption, focusing on tuna and other Seafood an also value added ready to eat Seafood appetizers this experience has taught us what our suppliers and customers must do to succeed. Our desire is to build relationship based on excellent communication, reliability and trust. The main markets for its products are Japan, United States and Europe. Rainbow Foods (Pvt) Ltd is been able to fulfill the demands in the industry to earn foreign exchange and to develop the economy of the country. 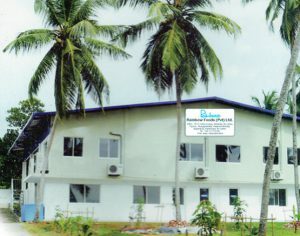 Our factory is situated closer to the main international airport Sri Lanka and at Dankotuwa trade zone in further move to diversify its Seafood; the company dedicates one of its new plants to the processing in 2009. The company recognizes that it is important to commit to the protection of the environment, the employees and the community where we operate. The Company employs around 50 people. One of the greatest assets is Human resources. Through them the company is able to keep the clients loyalty, produced high quality products according to the market needs. It encourages their employee’s career development, provided constant training, and rewords their performance. We are engaged in fishing using our multi day fishing Boats in Indian Ocean. Production and quality policy of the enterprise complies with the standards of good practice. Capitalizing on its systems of vertical integration, introducing 100% wild catch tuna to its offering. It has implemented the quality control systems such as HACCP and EU regulations which makes its wholesome production facilities with high technology produced in German and Australia because of it the quality level of production always guarantees. Retailers and distributors around the globe rely on Rainbow Foods (Pvt) Ltd Sri Lanka vertical integration to deliver a constant supply of high quality Seafood at industry setting price. Our vision is to alleviate poverty by producing essential seafood with synonymous quality, service, and value to the world and creating employment opportunities for under privileged communities of Sri Lanka while utilizing Ocean for maximum benefits for national economy and become the Pioneer in Seafood. Key to vision of Rainbow Foods (Pvt) Ltd was their belief in managing as many aspects of business as possible not only fishing fleet but the processing factory transport and line of trading as well. This outlook enabled them to steer a more forward-thinking course despite market fluctuations. Thanks to this commitment Rainbow Foods (Pvt) Ltd shortly become the premier supplier of Tuna and other Seafood in the world. Provide excellent service to both producers and customers. To elaborate high standard products focusing on quality, efficiency and custom satisfaction. To implement modern methods of catching Fish, other Seafood and obtain the maximum yield over the national average. To maximize the utilization of Ocean using up to date technology and process Seafood and thereby increase local and global food production.